So my testing has confirmed that with the 1:1 dilution of Diafine in a JOBO at Rotation P you need to extend your development time to 6 minutes in part A and part B and also run at a temp around 25 C. If you choose not to, you will find that films like 400TX die after about EI 800 (shadows get a bit too thin for me) which is about a stop lower than is expected with the Diafine/ 400TX combo. If you only want box speed to say 800 with 400TX then the standard 3 minutes in A and B is fine. So today I ran a test to compare 1:1 and full strength Diafine also in a JOBO. Density as you would expect is a tad bit higher at the full strength but not by a lot… again I am extending the time to 6 min in A and 6 min in B. The contrast of the full strength is also a tad bit higher, but nothing a good scanner could not work with…. but the 1:1 is soooo nice. With regards to high speed films, Kodak TX400 works out to a usable E.I. range 1:1 (6 min A and B) from about 200/400-1600 with 3200 somewhat usable…. maybe! Ilford Delta 3200 is amazing with this developer and is nice from about 100/200 – 1600 with 3200 also quite usable in a pinch ( note: you have to love grain to love this film)! The now killed Kodak P3200 is still undergoing tests as it is still around in good supply and it looks like it will have a very solid 3200 but much more grain than the Ilford… which could be nice! I love grain!! Ilford Delta 3200 and Kodak 400TX both Diafine Developer at 1600. The Kodak 400TX has nice grain but wow the Ilford is just stunning…. The Ilford is only long term bet as of now – much lower contrast and very easy to scan across a wide range of EI. All the scans above are 100% crops from a very large 35mm scans at 3000 dpi on my Imacon Scanner (I decided not to do 6300 dpi on the scan just to save time and sharpening is off on the scanner, -120 setting). I am glad you posted this article. I have been running several tests in my Jobo with Diafine as well using the 1:1 dilution with good results. I have been using 4/4 for my A and B baths at 1:1 and printing classic gelatin silver prints. I expect they would scan just fine. One of the wonderful things I love about Diafine is its reuse properties, so I started testing this last week using full strength Diafine in my Jobo at speed 1 (CPE 2 Jobo) at 7 minutes 22C/72F. I don’t typically scan my negatives, so our application is a little different. I typically either make gelatin silver enlargements from 120 or 4×5 negs or alt contact prints from 8×10 negatives (typically Pt/Pd, Van Dykes, etc) so the extra contrast really shines with these prints. 1 – For Jobo (CPE-2 at motor 1) – Diafine 1:1 at room temp at 4/4 for EI ranging from 200 to 1600 produce good negatives for classic darkroom printing. I have found that I need a #3 contrast filter over my #2 typically. I typically use 4×5 sheet film and 120 at times. 2 – For Jobo (CPE-2 at motor 1) – Diafine full strength (reuse for a year or more) at room temp at 7/7 for EI ranging from 200 to 1600 produce higher contrast negatives suitable for classic darkroom printing with #2 or at times #1 contrast filters and really good for alternative prints. 3 – When on the road I use the same Jobo 2509 reel and drum with a stopper, but use Diafine full strength at 4/4 and invert tank a few times at 1.5 and 3 minutes for A and B bath. This produces a similar negative to #1 above, maybe a little thinner at times. Keep writing and sharing… Good stuff!! I see you are using motor speed 1…. I’m using P which is 5 so quite fast and yes more grain but no bromide drag… At 1 are your negs clean of streaks? You also state 7 for full strength…. I assume 3.5 and 3.5…. No streaks for me at all… when I state 7, I mean 7 min in A bath and 7 min in B bath. I’ve ran more film through since my first reply to include several pinhole negs using Tri-X with the full strength Diafine at 7/7 and definitely an improvement in the shadows vs the 1:1 at 3.5/3.5. Also ran several sheets of Fuji X-Ray through using full strength at 7/7 with good results too. It seems it is hard to mess up with Diafine! I have always called it, “Zone system in a box”. Yeah I found the straight gave really great shadows and extended the usable EI to a stop + better than 1:1…. 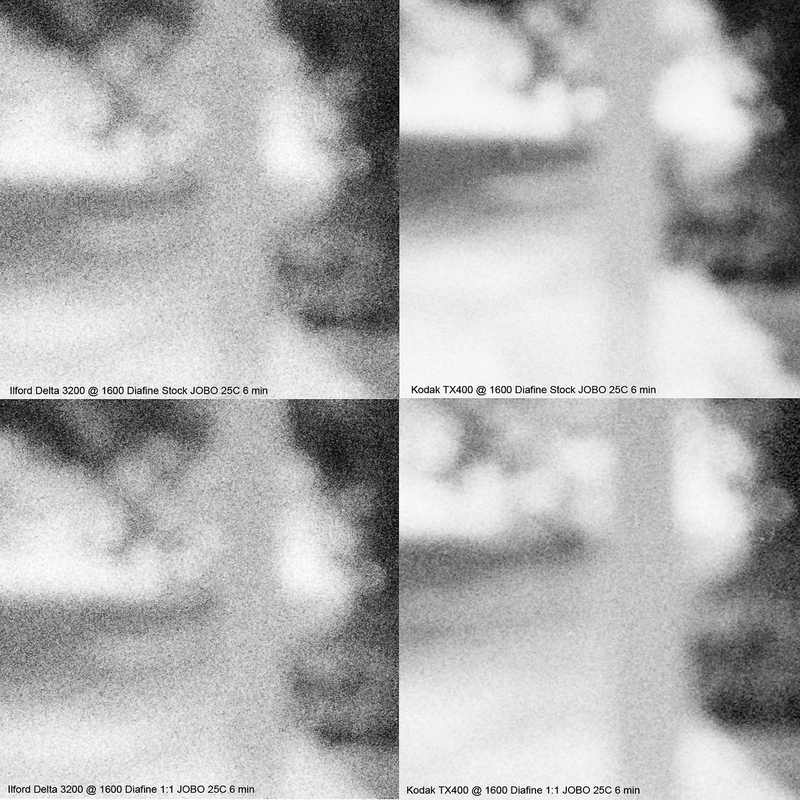 I know the rotation speed at P is fast and of course will add grain and contrast… I agree Diafine Rocks! And you run at rotation speed 1…. Will give it a test today. P is about 75 rpm. Not a priority buy will look into it…. Thanks for the suggestion.